I love food tours where you get to sample a variety of things from different places for a reasonable price. Every big city seems to have them now. Even in Sacramento we now have Grubcrawl, Dishcrawl, and Local Roots. In Honolulu there are a couple of food tours as well. I chose to go on the Taste of Chinatown tour with Walter Rhee. Walter grew up a Korean diplomat's son and so he was exposed to a lot of Asian travel, cultures, and food. As an adult he got a degree in marine biology but soon found that his interest in eating his studies was greater. He then got a Master's in food science and has taught it at the University of Illinois and the University of Hawaii. Currently he's been teaching cooking classes, writing a cookbook, and taking people around Chinatown to taste the treasures found there. Due to his food science and cultural background, his tours are full of all sorts of interesting food facts. I was privileged to be given a private tour on my last day on Oahu. I met Walter in Chinatown where he was toting a wheelie with an ice chest and bag. In it he had silverware, napkins, Wet-naps, plates, baggies, etc. Everything we could need for our trip through the area. The first thing he did was have me taste a shrimp wonton he had bought somewhere and asked me to try to remember the flavor because I would taste another at the end of the tour. Then we were on our way. The tour winds through the small area that is left as Chinatown in Honolulu. Back during the War this was also known as the brothel district. What is fun about it is that you can almost feel like you are in Asia instead of on U.S. soil because there are plenty of open stall markets and colorful sights to see. He asked me if I had ever had sugar cane juice. 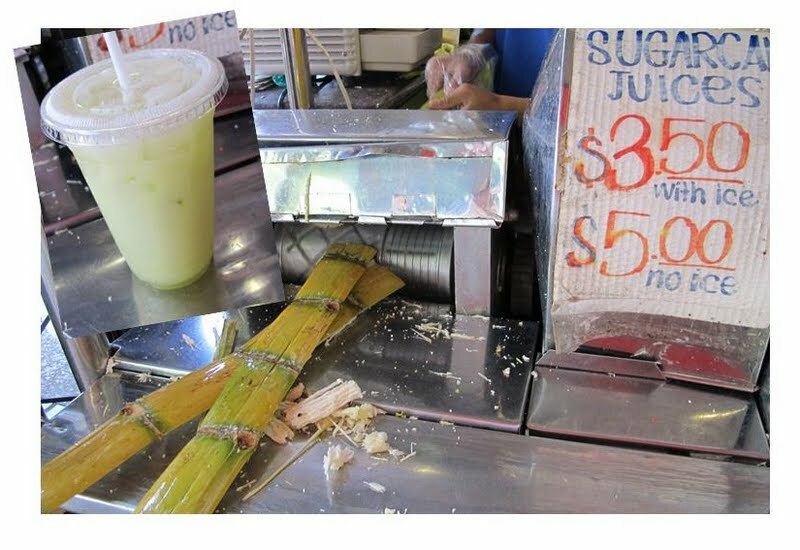 I told him I had gnawed on raw sugar canes before, but never had the juice. We stopped at a stall where he ordered me a glass. The boy inside took several canes and processed them through a press to get a out a light yellow green juice served over ice. It was light and refreshing, but also fruity in its own way. Walter explained that by drinking the fresh juice I was getting a bunch of nutrients that are processed out when they make granulated sugar. Along our route Walter would point out the better restaurants and ignore many others. He would pop into one and order a specific dish for me to taste. At one point he passed a tree and handed me a leaf. Could I identify it? I couldn't, although it smelled familiar. It was allspice. I had always thought allspice was a spice blend of several spices. Instead I find out it is a spice all on its own. I asked Walter about his tours. He used to offer a Cook's Tour of Chinatown as well but found that people were always curious about what they were missing out on from the other tour. He's decided to merge the two tours together and just offer one overall tour now. He explained that normally he'll have a group of 8-15 people. The more people, the more dishes to try. This made sense to me. I had paid him $80 for the tour, which seemed a lot. I soon realized that the money was going to pay for all the dishes he was buying. He wanted me to take the leftovers home with me, but I was leaving the next day and didn't even have a frig in my hotel room anyway. I felt guilty that these large amounts of food might be wasted. After all, I have a small stomach and only tasted all our finds. I could see that if you had a large group, it would be easier to share these dishes, have many tastes, and still come away satisfied. We made a stop at a local Vietnamese store. Walter explained that in many cities the Chinese were leaving Chinatowns and the Vietnamese were taking over. This was a reason you would see a lot of crossover of cuisines. In the store he bought a few items to try before we headed to the food court. This is a find! There's this indoor, hidden away, international food court at 1120 Maunakea Street. Because we are in the U.S. you can't find street food carts like you do in Asia. This indoor food court serves the purpose in a brick and mortar way. Inside are many vendors with stall shops serving every Asian food you could ask for. Filipino is next to Korean, next to Vietnamese and Chinese. It reminded me of similar food courts in Manila and in Singapore. We found a table and Walter picked up a few more things. He bought some duck at one shop, Chinese doughnuts at another, and Vietnamese soup at another. Walter bought a jar of plum sauce for us to use over some roast duck. He explained that many plum/duck sauces that are found in the U.S. are not even made with plums at all. They are made with apple sauce, molasses, sugar, and mascerated cherries. You need to read the labels to be sure you are actually getting a true plum sauce. I noticed the flavor difference immediately. This plum sauce was fruitier with a natural sweetness to it over a sugary sweetness and pastiness found in the fake version. He gave me the bottle to take home. I tried the Vietnamese soup called Hu Tieu Mi Hoanh Thanh after I added all the garnishes. The soup stock was made with pork bones and dried squid. Walter explained that the way to eat it is to dunk the Chinese doughnut. Here was an example of the cultures mixing. I mentioned that I had never witnessed people using doughnuts with their soup when I had been to Vietnamese restaurants in Sacramento. He said if I asked for them he was sure the servers would have them in the back, as it is the way most of the people like to eat the soup. The Chinese doughnut is savory in that there is no sugar added. It's also more porous and crispier on the outside. It sops up the soup beautifully and compliments it very well. Next were some of the Vietnamese deli foods that were mostly made with a rice flour/coconut milk base. All of these came with a side container of the same sweet chili sauce. This yellow one was the rice flour, coconut milk mixed with tumeric to give it the color. One of the dishes he had me try was salted fried rice. This is different than most fried rice Americans are used to because it does not use soy sauce. Instead they use salt to enhance the flavors of the ingredients. Walter explained that if you whip an egg and cook it you get cooked egg. But if you add salt during the whipping of the egg and then cook it, it gets a bacony flavor. It's a way of cheating to attain certain flavors. If you want salted fried rice, it will often be on the menu as Yangzhou fried rice. We stopped to grab a manapua at a shop. Manapua is the Hawaiian pidgin word for what we know as Chinese bao. This one was very good, but the noticeable difference was that the pork filling was more of a mash versus the diced pieces of meat that we get in ours in Sacramento. Remember that shrimp dumpling at the beginning? It was time to try the final bite. Walter asked me what was different. I said it had more flavor, definitely garlic, and the rice dough wrapper was stickier/chewier. He explained that the cheap restaurant will make the one I had earlier, giving you the base item and it was steamed in water. A better quality restaurant will take those extra steps for a quality product. This one did have minced garlic in with the shrimp and it had been steamed with a liquid of water and cooking wine.